Padang Besar is one of the town in Perlis, located at the most northern part of Malaysia. Going further north from Padang Besar will take you to one of the many beautiful countries one can find in Southeast Asia named Thailand. Hence, many tourists and locals would take the KL to Padang Besar ETS Train before going to Thailand. * Duration might not be accurate and is only for your reference. Changes to fares are at the discretion of the KTM/ETS operators. Check out the duration from other location in our train duration page. 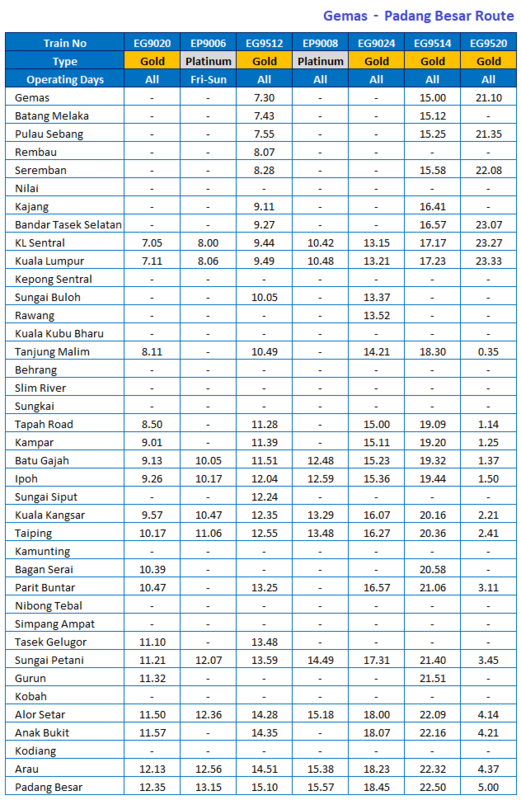 To go to Padang Besar by ETS train from KL, the EST train route is via Gemas-Padang Besar-Gemas route. Click here to see ETS train schedule for ETS train from KL to Padang Besar, valid from 1st August 2017.. Please click on the timetable for better view. In Kuala Lumpur, there are several pick-up point for ETS train service. Some ETS train to Padang Besar will depart from Gemas and travel to TBS (Bandar Tasek Selatan), KL Sentral and KTM Old Railway Station in Kuala Lumpur. In fact, KL Sentral is a more popular pick-up point option among tourists and locals. This is because KL Sentral is one of the transportation hub located in the middle of the city. 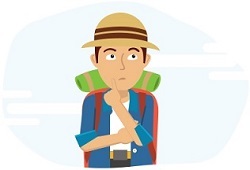 Therefore, going to KL Sentral is easier with so many options of transportation connected to the station. You can easily go to KL Sentral by LRT, MRT, KLIA Transit, KLIA Express, Komuter train and local buses called RapidKL. Bandar Tasek Selatan is another favourite pick-up point from Kuala Lumpur. The location of the KTM Bandar Tasek Selatan train station is just next to the Terminal Bersepadu Selatan (TBS). TBS is the bus terminal for long distance going in and out of Kuala Lumpur. You can also reach TBS via LRT, KLIA Transit, RapidKL or taxi. Alternatively, you can go to Kuala Lumpur Railway Station for boarding. The arrival point for ETS train to Padang Besar is at the KTM Padang Besar train station. KTM Padang Besar train station is located nearby the border between Malaysia and Thailand. If you are planning to go to Thailand, you can go through the immigration process in the train station. The immigration checkpoint for both Malaysia and Thailand is located within the same building. If you are planning to go to Thailand from Padang Besar, you either take the ThaiRailway (SRT) train from Padang Besar Malaysia train station, or take the minivan services available from train station. You can find many tour companies at the second floor. The train is comfortable and suitable to facilitate senior citizens and OKU or the disabled. Toilets are in coach B & E. Handicap toilet is in coach D.
Muslims can also find a prayer room in coach C right beside the F&B bar. Padang Besar is a popular gateway to Thailand. 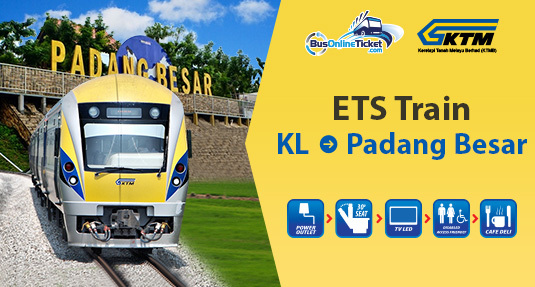 So, make your online booking for ETS train ticket from KL to Padang Besar in advance with BusOnlineTicket.com. You can secure your tickets and have a smooth journey. In addition, you get to save the time and cost of going to the train station just to buy the tickets.